Wow, Talk About a Scrapbooker’s DREAM JOB! AMERICAN CRAFTS is hiring a SCRAPBOOKER/CRAFTER. Yep, you read that right. They’re going to pay someone $28-33K per year plus benefits to scrapbook! Just think of all the pretty paper and rad embellishments you’d get PAID to play with! The American Crafts umbrella covers: AC (incl. Amy Tangerine, Shimelle, and Dear Lizzy), Pebbles, Crate Paper, Studio Calico, Imaginisce, Pink Paislee, Heidi Swapp, Bazzill, We R Memory Keepers and Project Life products. Your boss: “Oh, hello there. 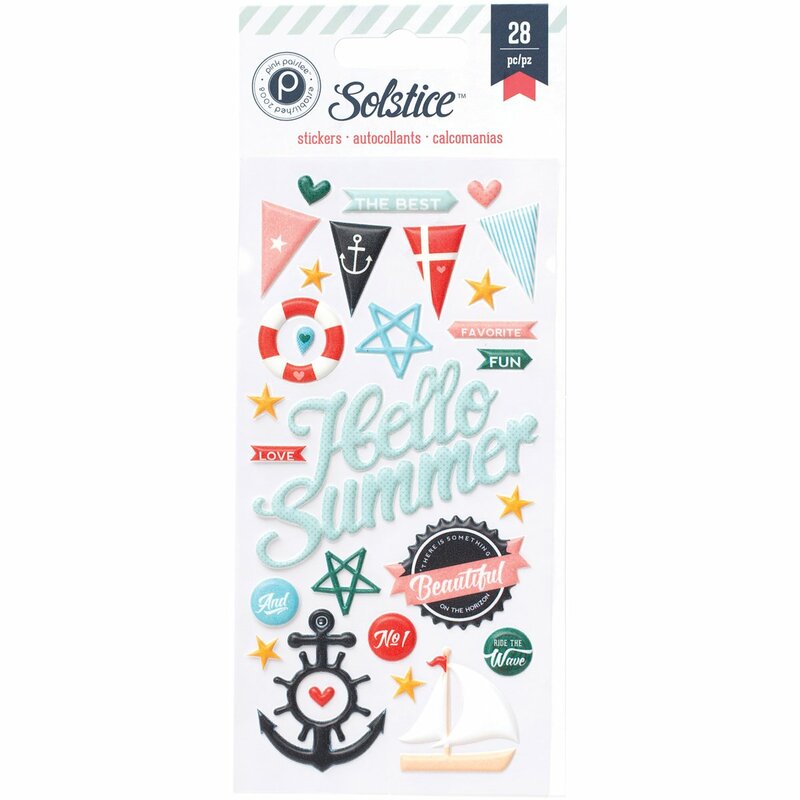 Could I please pay you to make something scrappy from these gorgeous Solstice Puffy Stickers ? Yeah, so. Darn. Guess I won’t be applying for this amazing dream job. I’m not willing to sacrifice my family. Plus it’s in Utah which is not where I live. And they have snow there, right? I’m not sure even THIS job is worth dealing with snow. Said the California beach girl. But I think YOU should apply. You know you want to! Just go HERE. Deadline is . . . well, I can’t find a deadline so get your bottom over there and apply before you miss out! It was posted 10-28-14 so hurry! Now if they ever need a work-from-home, scrapbooking fanatic blogger, social media freak, SEO expert who would promote their goodies and talk about their scrapbooking products TWENTY FOUR SEVEN, well, then I’m their girl! Hit me up, American Crafts. I’m here for you. Scrapbook Deals and Steals: Free November Scrapinar & October Afternoon “Public Library”	Scrapbook Warehouse Box Sale: Basic Grey Fall 2014! talk about a dream job, not sure the commute to New zealand would work for me though lol. Yes, Caroline, that would be quite a long one, LOL. Love your posts! You have a wonderful style of writing . . . I feel like I’m sitting across the table from you in a coffee shop chatting away!!! Thank you so much, Nadine <3 Comments like yours keep me blogging. I'm so glad you enjoy it. I really appreciate your comment.